Dodham was an area of land at the bottom of Stars Lane, adjacent to Dodham Brook at the foot of the southern slopes of Summerhouse Hill. Plague outbreaks in the 16th century saw the development of 'Upper Doddam', an isolation hospital set up by the churchwardens in 1587 "to house poor people visited with the plague" however Watts' 1806 map of Yeovil shows no buildings in the area. Dodham Cottages were a row of six cottages built between 1806 (Watt's map) and 1811 (they appear to be shown on the 1811 Ordnance Survey) at the far southeastern end of Stars Lane at the junction with Dodham Lane (also built between 1806 and 1811). Dodham Cottages were also known as Newton Buildings and Dodham Row. 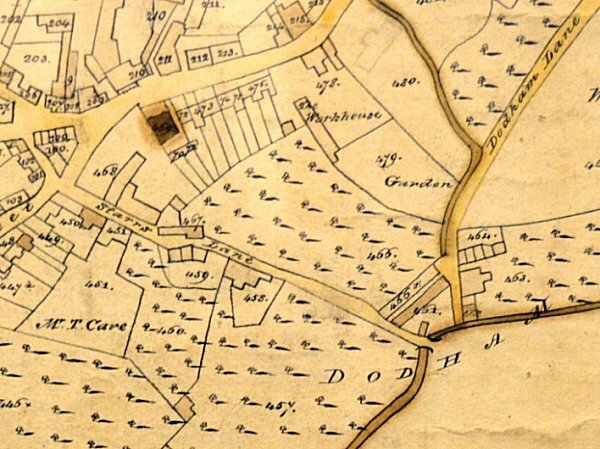 The 1841 census lists Dodham and suggests it was a small enclave of very poor housing that was almost exclusively lived in by glovers and their families. In fact the six cottages were home to twelve families - a total of 63 people living in six cottages! These were as follows - George Hambridge and two sons, William and Sarah Stroud and 4 children; William and Mary Trump, their daughter and his mother; Henry and Ann Cole with lodger William Masters; Thomas and Elizabeth Dodge and 4 children; Henry and Mary Hambridge, their 4 children and 3 lodgers; Thomas and Elizabeth Woolmington, their daughter and a lodger; Charles and Mary Phelps and their daughter; Henry and Elizabeth Bragg and 5 children (Henry was a carpenter); Mary Abbott and her 4 children; William and Jane Busby and their 4 children; Charles and Eve Phillips and their 4 children. Of these 27 men, women and children were listed as glovers, two were labourers, one a brickmaker and one carpenter. The 1846 Tithe Apportionment listed Dodham Cottages as 'Houses, Gardens and Orchard' (Parcel 497) and noted that the owner was Elizabeth Snook and the tenant was Henry Raymond although it is almost certain that Henry Raymond acted as an agent and sub-let to the occupying families. By 1851 the population of Dodham Cottages (referred to as Newton Buildings in the census returns from 1851 to 1871) had dropped to 44 with the families of John Harvey (No 1), Joseph Watts (No 2), William Burbage (No 3), Jane Singer and Elizabeth Dodge (No 4), George Hunt (No 5) and Mary Abbott (No 6). Again the occupations were overwhelmingly connected to the leather and gloving trades although there were also a couple of paupers. In 1861 occupation stood at 52 as follows - families of Henry Hiscott (No 1), Robert Jordan and William Oxley (No 2), Richard Tizzard (No 3), Elizabeth Dodge and Elizabeth Edwards (No 4), James Hann (No 5) and Samuel Munford (No 6). By 1871 the population had reduced to just 30 persons - families of Charles Abbot (No 1), Henry Hiscott (No 2), George Abbot (No 3), Edwin Slade (No 4), James Rowe (No 5) and Samuel Munford (No 6). The 1881 census referred to Dodham Row and listed 38 persons living there - families of John Adams (No 1), Charles Beer (No 2), George Abbott (No 3), George Russ (No 4), Charles Abbott (No 5) and Thomas Hyde (No 6). Only one person was connected with the gloving trade. In 1883 12-year old George Russ Jnr and two other lads appeared in the Borough Police Court accused of stealing 2½lbs of tobacco from the trap of John Taylor of Chilthorne which at the time was standing outside the Red Lion Inn in Kingston. Russ passed on some of the tobacco to Robert Beare of Newtown who "was well known to the police". Beare also ended up in court. At the same court sessions Russ was also found guilty of stealing and eating some bread rolls. He received six strokes of a birch rod for stealing the tobacco and a further stroke for stealing the rolls. In the same year, 1883, Annie Masters of Dodham Cottages - a "woman of ill-fame" - ended up in the Magistrates' Court charged with being drunk and incapable. The report from the Western Gazette, reproduced below, makes interesting reading. In 1903 the glove manufacturing and leather dressing company, Hawkins, Jesty & Ricketts purchased the six cottages with their gardens, for the sum of £650 (around £400,000 at today's value). The cottages were to the immediate north of their existing leather dressing yard (their glove factory was in Higher Kingston). By 1946, as seen from the aerial photograph below, the Hawkins, Jesty & Ricketts leather dressing yard that included Dodham Cottages had been demolished. Watt's map of 1831 showing Starrs Lane flanked both sides by orchards and running all the way to Dodham Bridge that crossed Dodham Brook in the area called Dodham - marked as such on the map. Note also Dodham Lane (built between 1806 and 1811) that ran from Newton Road to Dodham. The stream running down the right hand side of the map and then alongside part of Dodham Lane was the Milford Brook. At bottom right, marked '457' are Dodham Cottages. 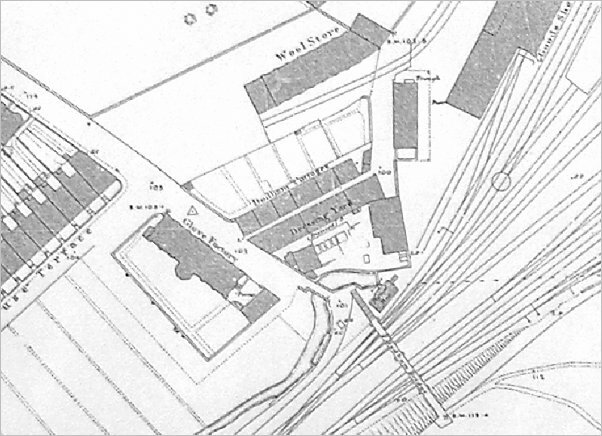 The 1886 Ordnance Survey showing Dodham Cottages, their gardens and the Hawkins, Jesty & Ricketts leather dressing yard at centre. 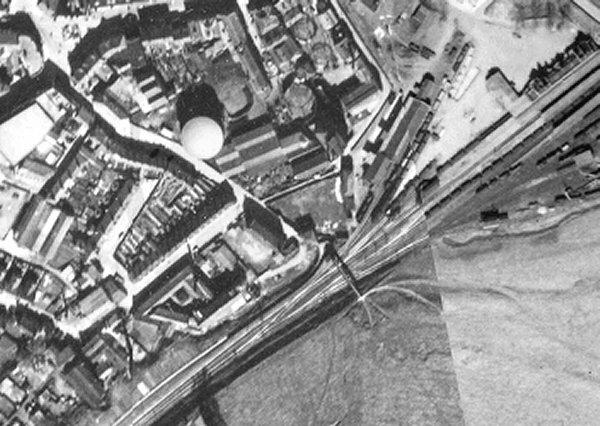 The 1946 aerial photograph shows Stars Lane running from South Street at top left to the bridge over the railway and the slopes of Summerhouse Hill in the bottom right quadrant. By this time the Hawkins, Jesty & Ricketts leather dressing yard that included Dodham Cottages had been demolished - the cleared site is seen at centre, above and left of the bridge. The report of Annie Masters' appearance at the Borough Police Court in the 9 November 1883 edition of the Western Gazette. Annie's fine of 2s 6s is around £60 at today's value. 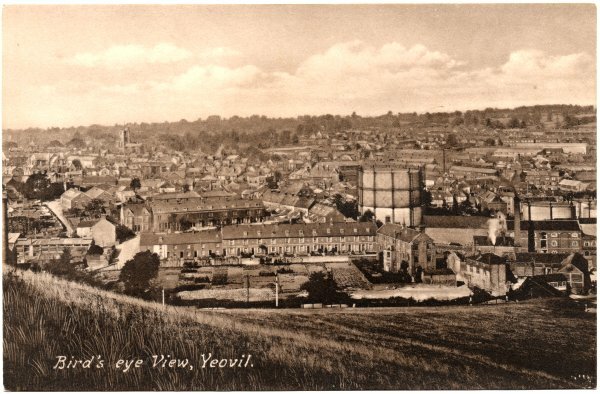 A postcard of around 1910 showing the view from Summerhouse Hill. 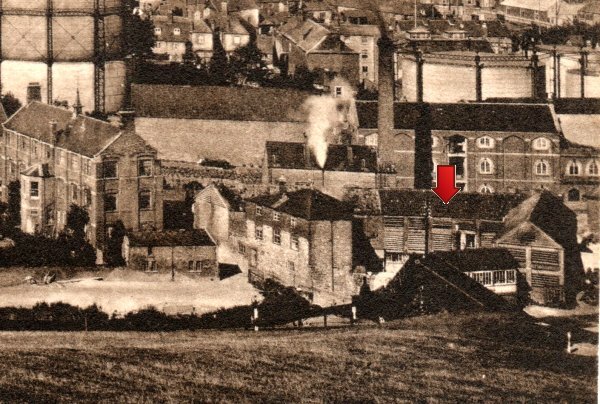 Summerhouse Terrace is seen at centre, to the immediate left of the gasometer, with the Ewens & Johnson glove factory known as Foundry House (one of the few buildings in this image which still exists) immediately below the gasometer. The Hawkins, Jesty & Ricketts leather dressing yard that included Dodham Cottages, is at bottom right and enlarged in the following photograph. Foundry House stands at centre left and the Hawkins, Jesty & Ricketts leather dressing yard is in the bottom right quadrant, with the former run of six cottages - Dodham Cottages - arrowed.